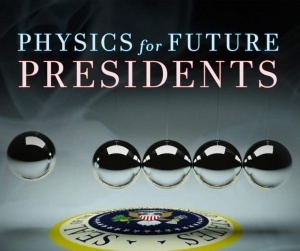 Physics 10: Physics for Future Presidents. Spring 2006. Professor Richard A. Muller. The most interesting and important topics in physics, stressing conceptual understanding rather than math, with applications to current events. Topics covered may vary and may include energy and conservation, radioactivity, nuclear physics, the Theory of Relativity, lasers, explosions, earthquakes, superconductors, and quantum physics. Prof. Richard Muller in class, in a shocking demonstration with a Van de Graaff generator.